I'm gonna put up a 'Snuffle Bear' video of me trampling on his face in week or so along with 'Pumping in my Slippers' video. aww hehe thanks. and ive come up with my next set. how does this sound? white top with butterflys on, red hair maybe??? glitter red toes, red glitter tattoo art on feet, red heart confetti, red tights and maybe mix in some red mesh tights and candy hearts. and i wanna wear new toe rings i bought. Last edited by TGirl Anna girly_feet_boy; 05-01-2010 at 09:48 PM. oh my Anna!! you just know those toes are perfect! how does this sound? white top with butterflys on, red hair maybe??? glitter red toes, red glitter tattoo art on feet, red heart confetti, red tights and maybe mix in some red mesh tights and candy hearts. and i wanna wear new toe rings i bought. It sounds great and I can't wait! I finally joined. I really like your site. So many things to check out. P.s. im getting a new laptop tomorrow. yay!!! Oh WOW I'm gonna cry... someone wants to write a song about me and my feets!!! That's pretty cool. Are you going to place it on your site after it is completed? Are you going to shiver in antici......................pation? Cool. I look forward to seeing them. There's 2 new feet worship stories about me written by a member of my site. More coming soon. Also my 2 new videos are nearly ready. I'll post again when they're up. Sweet(just like you, Anna! )! I cannot wait to see it once it arrives. Can't wait for more sets! I just wanted to say that I got the card in the mail on Friday. It was very nice! Lots of little hearts, a wonderful lipstick kiss(and a toe-prise as well ), and a little something extra in the card as well(I'll leave it as a mystery for the lucky people that have yet to receive their card ). There was also a sublime scent in the card, it was a really pleasant surprise! Thank you very much for sending it Anna. I loved it! Also a very sweet person who goes by the name Ares has recorded a super-cool and very beautiful song called 'Ocean/One' about and special for ME. At this time he is 'mixing down', which is musician talk for 'making it better' ... the song will go into a special slideshow with a few old pics from my previous 3 sets and will also have a descriptive story playing throughout the song to accompany the music...making it a very Unique and original Story-Song.... currently the running time is 5.30 and it will also (hopefully) be available as an MP3 from my site too. It should be ready by the weekend and will let you know also. I'm super excited about this as its a unique song made and recorded just for me and will make a very special slideshow when its finished. I really hope you guys enjoy it when its up..it has the most beautiful accoustic guitar and piano tune, so catchy and amazing. HEY, great news... the original SONG 'Ocean/One' which was recorded about and just for me by my member Ares is now up on my site to Download free as an MP3 from the intro/homepage... also Pleaseeeeeee watch it in the video slideshow on my site and comment on anything, as it is a very unique story/song. there are slides in the show telling the story behind the song which was also written by Ares. thanks for everyones continued support and love, its amazing!! I'm sooo excited about these new things. please enjoy them. Any chance of a set with heels? 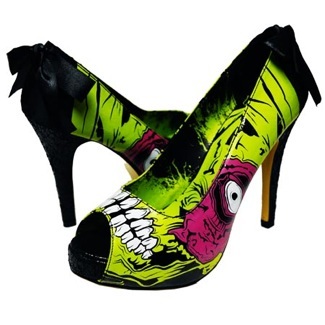 they so hot Zombie Heels, thats so MEE, im such rock chick hehe. hope evryone loves the downloads of my voice and the song recorded about me, download the mp3s on my intro page and in new Feet Fun section, got great responses already!!! I've added the Diary section to my site which i've been meaning to do for some time now. check this for updates and my thoughts etc hehe. gonna add 2 new scenarios to the Feet Fun section after some input from members. 'Eat from my feets' and 'My feet are your heaven' scenarios. Oooooh, Anna if you can get those maybe you could have a set where you go a little "squish happy" on some unfortunate fruits(watermelons would be a good choice). hey, thanks Shadows hehe. i wanna stick my heel thru some naughty fruits!! Glad you liked my idea. Hopefully it will bear fruit some time in the future. hey everyone, there's a new Diary entry on my website if you wanna read it hehe. Any idea when you could do a heels vid? its for my next set slideshow which I am putting together now and should be uploaded in over a weeks time hopefully, its called For You, so the tune fits to the set. I only have the long version and the shorter version ends how I want the slideshow to end. I finally watched "My Favourite Things," Anna. Thanks for making me smile.